Well I’m back for another blogging tips post. Sorry for all the guest posts lately. The backlog of submitted guest posts was just getting too big. Actually it worked out well since I needed a bit of a break anyway. Just when I thought I was developing a decent routine that gave me a bit of breathing room, things managed to get even busier. It was my own doing, but I’ll tell you more about it soon. Thanks to everyone who has been providing guest posts. I enjoyed having different points of view on my blog. Besides, it gets some topics covered which I’m not knowledgeable to write about myself. This week I’m covering a topic that I didn’t truly appreciate until I started blogging. It just wasn’t something that I had been really utilizing with my previous website marketing work. The great thing about blogging is that it is not a solitary activity. Even if you’re just running a small personal blog, someone is bound to comment eventually, even if it is friends or relatives. It’s that interaction that really separates a blog from just a website filled with articles. If you want to seriously take a blog to the next level, networking with other bloggers is so crucial. When there is a team willing to help you, I’m not sure why anyone would choose to struggle on their own. Unfortunately many bloggers just don’t understand how to effectively network and use those connections to your advantage. Early on most bloggers seem to judge the success of their blog by the number of comments each post gets. Many of them will figure out that the more blogs they comment on themselves, the more people will return the favor and comment back. That is an effective way to get comments and some direct traffic. The problem is that once you stop commenting, the traffic and comments dries up. This becomes an especially big problem when someone gets trying to comment on as many blogs as they can each day. All of that effort is likely just resulting in temporary traffic. I know I wore myself out on that pursuit in my early blogging days. The important part new bloggers are often missing is how blog commenting is really the ice breaker to getting to know other bloggers. By regularly reading other blogs and leaving comments, you are gradually forming a bond with those bloggers. If you are trying to become friends with 50+ bloggers all at once, chances are you are not giving sufficient effort to each of those relationships. Instead of becoming a close friend with any of them, you end up becoming only a casual acquaintance with the majority of them. Blog commenting is important, but make a point of focusing on the blogs that you most want to connect with. As superficial as it may sound, you may also want to consider which ones have the potential to help you the most. Think more about long term benefits instead of temporary traffic. I admit I’m still getting my feet wet with social media. In my case I’ve had specific reasons for quickly building up those stats, but I’m still figuring out what to do next. One thing is becoming quite obvious though…it is another great medium to further connect with your blogger friends For example, on Twitter I have a separate list for my closest blogger friends. That way I can pay attention to what they’re saying and sharing without too much other noise. Instead of going to their home (blog) to chat, this is essentially the schoolyard or water cooler where you can meet up to chat with a bunch of your friends at once. If you’re seen chatting with the cool kids, more people will want to associate with you. Rather than just using social media to chat, you can take things further and regularly share your blogger friends’ content. That way you are vouching for your friends and pointing your followers to quality content. If your blogger friends are the generous types, they’ll probably feel compelled to return the favor and share your content too. The part that I still need to do a lot more work is instigating more conversations with fellow bloggers and other followers. While social media is great for connecting with fellow bloggers, you really should be trying to connect with other people on there too. If you really want to connect with your blogger friends, public conversations only may not be sufficient. Eventually you’ll want to connect directly with those bloggers one on one. A lot of those conversations might just be about what’s going on in each other’s lives and getting to know each other better. Then there is the blogging related topics where you may want to confide private opinions. Maybe there is something they do on their blog that you really think needs changing. Or maybe you want their advice about your blog or anything else. Once you know each other well you can even find ways to help both of your blogs more. You could request a favor such as sharing a specific post with their readers or followers. In return they might have a similar favor they want too. Some of those favors might just build good karma and possible help later on. Of course these kinds of requests are much better received when the blogger knows you well and the request is fairly reasonable. Usually when I’ve been commenting on a blog for a little while, I will make a point of reaching to the blogger via e-mail. I might offer some helpful tips or I may just tell them what I think of their blog and ask some questions. Really just start a conversation with them and see where it goes. The conversation may die off, but you can always reach out to them again later. This is the part where I am jealous of all the bloggers headed to the FinCon conference next week. That is where some of those connections can really blossom. For the more outgoing people, they might even develop all new relationships with bloggers they didn’t even know before. When you get to meet online friends in person, you get to truly put a face to their name. Sure you might have seen a photo or two, but that doesn’t always represent who they really are. Unless they happen to have posted videos, you probably don’t know their voice either. In those face to face conversations, you can find out so much more about them. The more you know someone, the more willing you usually are to help them out in any way you can. Unless they end up being total jerks, you sincerely want to help them succeed. It might even be the next step in becoming life long friends. When I’ve met up with local bloggers, afterwards I could relate to them a lot more. Instead of being some anonymous blogger they were suddenly someone real. Now I try to go out of my way to help those bloggers. With some of them we’ve met up multiple times and are becoming good friends. We’ll probably all keep meeting up regularly, partly due to the convenience of networking with local bloggers and also because they’re genuinely good people. It is this kind of networking that makes blogging so enjoyable. Comparing this to the marketing I do for e-commerce websites is night and day. One is based on friendly cooperation and one is cut throat competition where competitors are enemies. It’s a big reason why I have barely touched my old websites since starting my blogging journey. So when you’re doing blogging ‘work’, don’t lose sight of the personal connections behind it all. Those connections might not pan out immediately, but as you build those relationships, you’ll likely end up with so much more than just some temporary traffic. I can’t guarantee I’ll have the time to comment back on everyone’s blogs, but it would still be great to connect via e-mail or social media. If we haven’t chatted before, give me a shout sometime soon. Or if we have chatted before and haven’t been in touch much lately, it would also be cool to hear from you again.Does anyone have any blog networking tips to share? I’m sure there’s more than one way to skin a cat. Is it wrong for an animal lover to use that phrase? Thanks again for such a helpful post Jeremy! The more I get into this, the more I see the importance of what you wrote about. The nature of what we do can be so impersonal on one level, that networking helps put a face, albeit digital, to other PF bloggers. Hope you had a nice break btw! You’ll notice it even more once your blog gets started. There will be times when you can’t comment on other blogs as much. Some people will notice and not come comment on your blog those days. The stronger the connection you can form with people, the more understanding they will become. Can you make a backup of that brain of yours and upload it in the cloud for everyone to pick through slowly? Your head is full of things I don’t know and would love to learn. BTW, thanks for sharing my posts and mentioning me all the time! lmao Veronica. I’ll get working on that backup 🙂 In the meantime I’ll just have to keep sharing on here. More great tips! We are still learning all of this so we really appreciate it!!!! I am also jealous of those going to FinCon =( We already planned a vacation before we knew about it. Otherwise we would have gone. I will be relaxing on the beach that weekend…poor me. Just kidding! Have a great day! You seem to be doing a great job with it all so far. FinCon would definitely help a lot though. I’m sure you’ll be there in 2013. Enjoy the time on the beach instead. You’ll just have to do extra marketing via e-mail and social media to make up for missing FinCon. I feel weird calling it FinCon13 instead of FinCon 2013. It makes it sounds a lot older than it actually is. But yeah I’ll be there in 2013 wherever they end up hosting it. I agree with the “blog comment” strategy above. Comments should definitely be an icebreaker, and I’ve made some great contacts through reading blogs (you, in fact, reached out to me outside of comments, which was an awesome strategy). Nothing less helpful or bonding than a quick, meaningless note from somebody trying to speed through my blog on their way to the next one. Exactly, the quick comments don’t help anyone. I feel less of a connection when someone just uses my blog for a quick link. It’s not what a friend would do anyway. In your case I might’ve left some comments a while back, but I did end up going the e-mail route to connect further. Networking with bloggers has been a huge key to building my blog. Having relationships with you and a few other bloggers has given me a place to go and seek help when I don’t know what I’m doing. The commenting on other blogs to build traffic was quite a bit of pain. I am commenting on a lot of people’s blog now but hopefully that won’t have to be for forever. What is your goal with your blog? Yeah I should’ve stressed that part more in this post. The connections you build can be an awesome source for advice since they have gone through a lot of the same stuff with their blog. It’s better to learn from asking questions than trial and error mistakes. I’m planning on eventually scaling back commenting, but I think it’s something that needs to be kept up long term. It just doesn’t have to be done to such a high degree later on. As search traffic builds up, you become less reliant on the comment traffic. Still, you want to maintain all the connections you’ve built up and get to know them further. Welcome to the newbie circle. I visited your link but came to a landing page. Where is your blog? That’s true. It looks like William’s blog forces you to a landing page, which honestly isn’t very good for networking with bloggers. It limits how much people can get to know you. I am really enjoying getting to know everyone too. I love how supportive and generous everyone seems to be. The jerks are definitely a minority. I agree I signed up for his email and never could make sense of it, I prefer a blog. An e-mail list is definitely a much different beast than a blog. I can see why people would prefer more of a two way communication form of media. These are great tips and I love how you’ve laid it out as not just a way to grow your blog, but also a way to build genuine relationships with like minded people. I think that’s what I’ve gotten most out of networking, the additional blog traffic is a secondary bonus. I think I’d be too nervous to reach out to some of my fellow bloggers via email though, but then, I’m painfully shy about that stuff. Don’t be shy about e-mailing blogger friends. Everyone who reads your blog knows what a good person you are and would gladly welcome e-mails from you. I can be pretty shy too, but I don’t really have that problem with e-mail. Networking does build a lot of genuine relationships, but with those relationships comes all kinds of help for your blog. So it’s really a win-win. Thank you for the Twitter mention, Jeremy. Thanks for the feedback Jennifer. It’s always nice to get new blood around here. The time crunch does make marketing a blog rather difficult. That’s where it’s beneficial to focus more on select bloggers rather than trying to comment everywhere you can. You’ll get more support from those select bloggers and build much stronger ties. Think in terms of who you would add to you blogroll. Would you add somebody who just casually drops by to comment sometimes or someone who comments on your blog a lot and has been in contact via e-mail or social media? It’s funny, I only just came to one of those conclusions myself. Blog commenting. I used to hop around to different blogs, commenting all over the place during my work breaks and when I’d get home at night … and it temporarily helped traffic a little, but the moment I took a days rest from doing it, my traffic woudl drop back off. Dude is that frustrating. I FINALLY, and only recently, realized exactly what you said, pick your favorite dudes/dudettes and take the time to really read their posts and chat on twitter or whatever. Get closer with a couple bloggers and it seems much more worth the time! Sweet I guess I made your favorite dudes list. I’m honored. Unless you take the time to build a solid relationship, that back and forth help will only be temporary. The people you really connect with will be there to support you as much as they can. I feel like I could turn to my blogger friends for anything, not just help promoting my blog. They really are becoming true friends. It makes blogging easier and also more enjoyable. As a new (just over one month old) UK personal finance blog, it’s good to read advice and benefit from the experience of bloggers who have already trodden the same path. Writing a blog is hard work, and I’m slowly learning to pace myself. I started off writing more than one post each day, before facing up to the fact that that this is not sustainable for a part-time blogger. I haven’t really done a great deal of work on off-site marketing yet, and have to admit that the standard advice of commenting right across the blogosphere holds little appeal. I don’t have the time! And it feels a little bit to spammy. So the idea of focusing on a tighter group of bloggers makes sense. Yes trying to write more than one post is far too ambitious. Aim for 3-5 per week and you’ll be fine. Get going on the off-site marketing as soon as you can though. Take some time analyzing other blogs and figure out which ones you find most enjoyable to read and which ones might help you the most. You don’t want to be spending a bunch of time commenting on blogs you don’t like or on blogs where you are unlikely to receive any kind of support. Trying to comment on every blog is rather spammy. Instead gradually expand your circle based on what kind of time you can realistically commit to building those relationships. Long term even 3-5 a week is tough, focus instead on really good writing, also if history is any guide most bloggers quit after a year or two, blogging is simply to much work if your not making any money, The good news is even dead blogs contain a lot of useful info. Thanks Rob. I would never try to get that far ahead of my schedule. There’s just no way I could fit in so much writing in a short period of time. Even now with the amount of guest posts that I accept, getting that far ahead is nearly impossible. I agree Jeremy that networking is important but in all aspects of life. They do say “it’s all about who you know”. My theory is to be friendly to everyone as you never know who will be your boss or who you will need to help you out. I also think that hanging out and chatting with the cool people is important but I also think the new people or the people who are looking for a helping hand are just as important. You never know when or if they will explode and that hand you held out will be the one that grips and pulls you along with them. Just look at all the musical sensations that were essentially nothing that have become famous because someone took the time to hold out their hand. Share the love with everyone, be friendly and comment where and when one truly has something valuable to say rather than “just because”. There have been times where my mates who blog post something that I have nothing to say about so I don’t. Doesn’t mean I don’t care, it means I have nothing of any meaning to add. I respect that and I hope they do as well. I also think being able to handle opinions is important and we should learn from them rather then turn our backs on others. It’s not a popularity game because as we know most of the nerdy kids in school are the ones making the big bucks now and sitting in their yachts. Keep up the good work mate.. loving these posts… and I mean that! Ha! Wise words as always Mr CBB. That’s basically how I view helping newer bloggers too. Some of them you can just tell have a ton of potential and will likely become quite popular bloggers. Plus I just genuinely enjoy helping people even if there’s not much in it for me. Unfortunately I just don’t have the time to help them all out though. That’s just a fact of life. And you’re right that you don’t have to comment on every single post from your blogger friends. There will likely be posts that don’t interest you as much. You just have to find a good balance where you are giving as much to the relationship as they are. Sometimes there are other ways to give back besides commenting. I have met a lot of great people through commenting. It definitely is an ice breaker because the owner can get to know you before you send off that first direct email. I seem to get a better response rate this way. Yup. If you just e-mail a blogger when they don’t know you at all, they might not even reply. If they see that you’re already making an effort, they feel a lot more obligated to help you out. yay it’s Wednesday again! I really love these tips. I like commenting on others blogs (though I have to find more time for it lately-silly work getting in the way, right?) It does let you get to know a person once you start builing up that connection. Yeah why can’t work be more understanding and just provide more time for our own stuff? I know I wish I could comment on a lot more blogs, including yours. Unfortunately we all have to make decisions on where to focus our efforts efficiently. I’m hoping in the near future I can find ways to help out more of my blogger friends. There are so many interesting blogs and different styles of writing to be found. Some are very technical and some are more personal. I am enjoying finding the ones I like and hope to build a relationship with. I am commenting lots now, but I can see how that would get harder if my own traffic increases. I’m still learning twitter and am not sure what to do with google+ and facebook. I look forward to these Wed posts. Thanks. The trick is finding the blogs that you enjoy the most as well as the ones that are most beneficial for you to leverage. With so many different kinds of blogs out there, there will be a lot that fit into that category. As you get commenting you will find out which ones you really connect with and then you can focus your time there. These are all great ideas. It occurred to me Twitter has lists that you can build. I need to start using it. Commenting has allowed me to really get to know the bloggers and their community. I can’t comment everyday, but I try to keep up with it through Google Reader. My schedule is tight, too and to pursue commenting on a daily basis could leave me burnt out. Like you I’m jealous of the other bloggers heading to FinCon. I would have loved to meet the other bloggers face-to-face. It would help with forming strong relationship via online. I didn’t use lists on twitter for a long time. Now that I have, it is so much easier to chat with your real connections. With commenting I do try to do some every day, but I do find that I have to limit the number of blogs I commit to or it gets out of hand. It makes me feel bad about the new commenters here that I don’t have the time to help out though. I’m hoping the extra stuff I do to help out makes up for that. That’s a good plan to make sure you spend enough time with networking. Some people figure they just need to worry about writing good content and the rest will take care of itself. It just doesn’t work that way though. When I first started blogging I had no idea that I’d become immersed in such a great community. Now I have multiple communities that I enjoy being a part of; social media bloggers, travel bloggers, personal finance bloggers and etc. Each one bringing a different aspect to my writing and my interaction. I absolutely love it! I don’t know why people don’t take advantage of blog networking more. Especially the meeting in person part. After attending FinCon last year, I’ll have to be dying than miss future conferences like that. It changed my life and especially my blogging career forever. Sure make me even more jealous that I’m not going Carrie. The interaction with other bloggers is pretty cool. I just wasn’t expecting to have made so much progress at this point. If I did I totally would’ve booked the ticket and flight. My investment portfolio will appreciate the extra cash though. By waiting until next year I figure I can get a lot more out of something like that. It sounds like someone is part of a certain cult if alexa ranking is important to you. Blog commenting does help with morale and networking in general just makes blogging quite enjoyable work. I definitely need to work on the email networking. I just never think of emailing another blogger I like to say hey or ask for advice, but I should! There are all kinds of excuses to reach out to a fellow blogger. Just be sure it isn’t something that is a waste of time. So ideally you do have a legitimate reason to reach out to them. I was blogging for over a year before I ever thought about blog networking. I can’t believe how essential it is to spreading the word and motivating me to continue. I’ve learned way, WAY more than I ever expected through blog networking, most notably through MM and e-mails with you. Speaking of that it’s been a while since we chatted. It would be good to catch up now that you’re back into blogging again. I never did hear more about that other website you were considering starting. Blog networking does make a huge difference, both in marketing effectiveness and avoiding burnout. I definitely saw a temporary bump in traffic from commenting a while back, now I’m trying to work on the relationships with just a few bloggers like you mention above. I’d still try to keep up a fair amount of commenting just to keep momentum going, but be sure to concentrate more on the ones that you most want to connect with. The stronger connections will come in very handy. Regular commenting really does build relationships. I never really thought of it that way, but you learn a lot about people from their comments. I have spurts of commenting, then i get crazy busy and can’t do it so much. I really enjoy that there are people who will regularly comment on my blog, whether I have been MIA or not. And private emails is something I’m working up to. I have done it a few times, but am still a bit nervous for some reason (not sure why). I’m excited to see when I am a year from now, and really should probably set some blogging goals. Thanks for the great knowledge again, Jeremy. Helpful and practical as always! No problem Jake. I used to be more picky about not commenting on a blog if they go MIA, but with closer connections I tend to give them more slack. I’ll try to keep supporting them knowing that they’ll likely return soon enough. Or sometimes I’ll directly e-mail them to see how they’re doing if they haven’t been around for a bit. I think your blog should really take off. So I’m interested to see where it goes too. You’ve got a great writing style and you always manage to keep things entertaining. It all comes down to how you approach that networking. For some people it does feel like a chore because they are spending minimal time getting to know bloggers while focusing on just getting their name out there. The more you treat it like actual relationship building, the more you get out of it. It is tough to spend as much time as we’d like on it though. I want to be your blogging friend! Thanks for the great tips. I think that my favorite part about blogging is meeting all kinds of people with varied interests and expertise who can broaden my horizons. You do learn so much from fellow bloggers. They each bring their unique experiences and knowledge to the table. Sometimes what you learn isn’t even related to finances. Seems that lots of people feel that way. I always get a decent amount of shares for these posts, which is honestly partly why I keep the series going. Yes blog networking is very important. You don’t have to comment on every post of a blogger to know him/her fully. There are other means as well to network. Thanks for mentioning my twitter handle. Yup, commenting is just one route to take. I’m sure you could grow a blog successfully and get to know a lot of bloggers without ever leaving a single comment on blogs. Of course at least some commenting does help though. I don’t do as much commenting as I should. I rationalize it by the fact that it does take a lot of time and I have so many other things going on in the evening. That said, I definitely fall in the comments=success camp. It’s all about the conversations for me. I consider 10 comments on my post > 50 pageviews on it. Well I am honored that you seem to always find time to drop by here and comment. Thanks Ed. I guess I do still consider number of comments as a sign of a successful post…well that and number of social shares. It is a nice simple way to gauge it at a glance. These days I just don’t get too worried about it going up or down. I really like your thoughts on Twitter and the water cooler chat idea. I think Twitter is much powerful social media than any other including FB as it allows you to get connected with short phrases without any other fluff. Indeed, blogging is a great way to build friendship and help each other to build readership. I’m not sure if twitter is more powerful than facebook for networking, but it is the network of choice with the financial blogging community. I know some people do much better on facebook though. I suspect that facebook would be much better for reaching average people since they’re less likely to be on twitter. I do admit there are some benefits to just plastering your blog name all over the blogosphere, but then you miss out on some other key benefits. Your strongest connections are ultimately who will be able to help you the most. I’d actually respect myself less when I would be wasting time trying to connect with bloggers who I didn’t even like. Now though I’m pretty happy about who comments here and which bloggers I have been connecting with. You do a great job with all that networking Michelle. I can be somewhat shy in person but online networking comes natural enough. Some of the social media stuff is still taking some getting used to though. All of the e-mail help I give people is just about wanting to help people, but it is cool when the karma comes back my way. you’re not coming to FinCon? say it ain’t so! Yep unfortunately I didn’t make it in 2012, but I fully intend to attend in 2013. Commenting has allowed me to build connections with other bloggers. I need to do a better job of using email of reaching out but my private life is quite busy and has definitely impacted the amount of time I have to blog. I find twitter a great way to connect with others as well. Great tips Jeremy, anytime you want to guest post on Bloggers Classifieds Blog just let me know! Thanks for the offer Paul…only 6 months late replying lol. 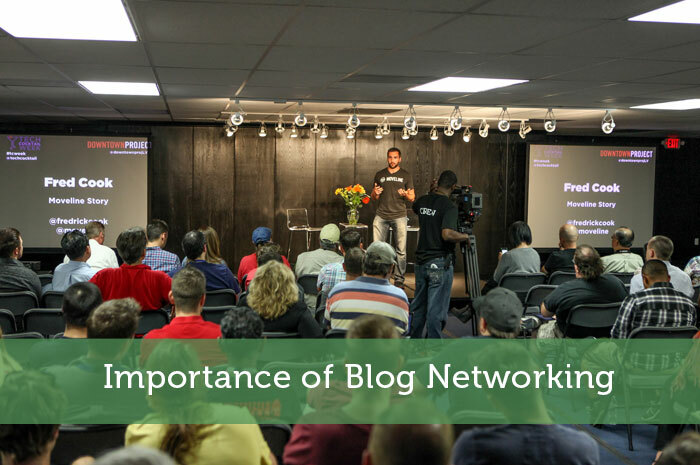 It can be incredibly tough to fit in as much blog networking as we’d like. So we have to pick our places and do what we can to fit in more when possible. The form of communication you use is up to you, but I find that e-mail communication creates much closer contacts. Firstly, thanks for the follow on Twitter. No problem Janice. Good luck with your new blog and your networking. Reach out to me if you ever have any questions. Great post. Blog networking is absolutely important. It’s actually more work than blogging in itself is, but can pay out in spades.